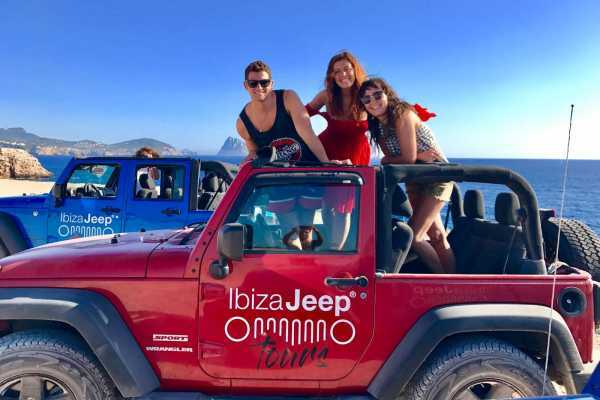 Ibiza Jeep Tours. Freedom without limits !!! You will get to know the true esence of the Island, most hidden secrets and incredible landscapes. Discovering Ibiza. Come and join us for day full of fun and Jeep adventures. We focus on personalized service, taking care of our customers with the idea of sharing an unforgettable experiences. 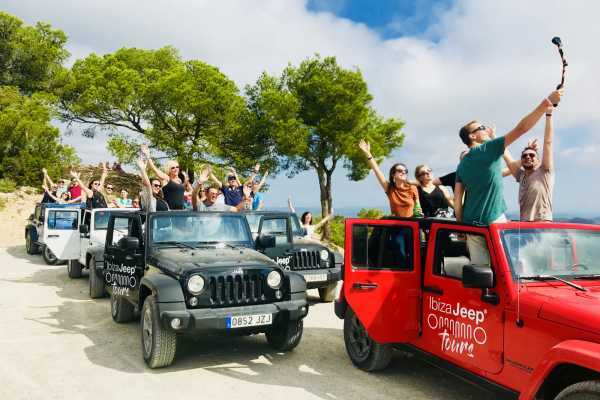 Ibiza Jeep Tours is the only company in Ibiza that specializes in tours with brand new Jeep Wranglers Rubicon. 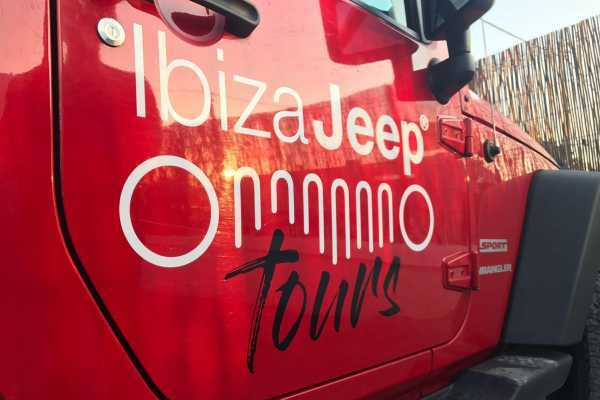 Ven a explorar lo mejor de Ibiza en un excitante tour safari a bordo de Jeep Wrangles últimos modelos nuevos a estrenar. Es un servicio personalizado, una experiencia única y divertida en la que visitaremos lugares increíbles. Descubriremos algunos de los secretos mejor guardados de la Isla paseando en Jeeps 4x4 descapotables. También podemos ajustar esta experiencia a su medida teniendo en cuenta sus gustos y preferencias. Recogida en alojamiento 11:00 / 11:30hs Conduciremos hasta el punto más alto de la Isla para disfrutar de una visión panorámica de Ibiza. Baño y snorkeling en una cala secreta. Visita a una torre de defensa del siglo XVII conduciendo por caminos rurales y con impresionantes vistas de la costa desde acantilados. Salto al mar desde las rocas para bañarse desde un lugar espectacular. Nos acercaremos a contemplar la majestuosa isla de Es Vedrá. Uno de los lugares más mágicos y misteriosos de la isla y punto de peregrinación casi místico. Conduciremos de regreso al punto de partida o lugar de residencia. Join us to discover Ibiza and watch from a unique location one of the most famous sunsets in the world. 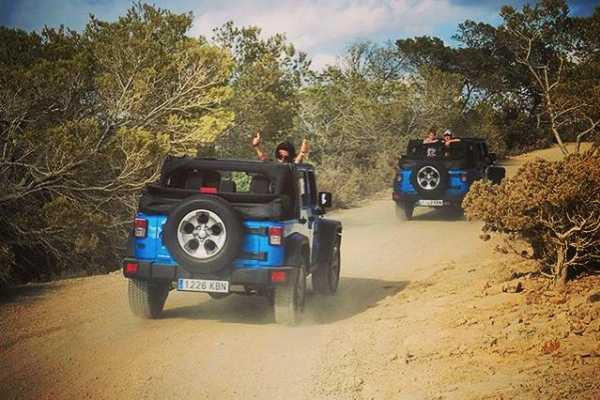 This is an adventure with brand new Jeep Wranglers to feel the freedom to drive an open vehicle. Discover Ibiza as you drive down old country roads. A fun and exciting way to get into nature and have privileged access to different planned routes. The experience ends with a well-deserved ice cold drink. Including: Departure is at 5:00 / 6:00 PM / We can offer you several options: 1-Drive to the highest view point of the island to appreciate a 360 view and from there visit a cliff with views to the mystic Es Vedra rock island to enjoy a magical sunset. 2- Drive to a historic defense tower exploring trough a forest and off road track beside a cliff with amazing views to the line coast. Sunset Cliff diving and bath at a unique spot. 3-Drive to the country side to visit the authentic wine yards of Santa Inés and San Mateo have a tapas stop while enjoying a country side sunset. Join us for an adventure with brand new Jeep Wranglers and feel the freedom to drive an open vehicle. Discover Ibiza as you drive down old country roads. A fun and exciting way to get into nature and have privileged access to different planned routes. Once on the track you can enjoy cultural visits, hippie markets or a relaxing bath. The experience ends with a delicious tapas tasting or sipping a well-deserved ice cold drink. Including: Departure is flexible. We offer your several tours options: 1-Drive to the highest view point of the island to appreciate a 360 view and from there visit a cliff with views to the mystic Es Vedra rock island. 2- Drive to a historic defense tower exploring trough a forest and off road track beside a cliff with amazing views to the line coast. Cliff diving and bath at a unique spot. 3-Drive to the most authentic hippie markets like Las Dalias or Cala Leña. 4-Drive to the north and visit the most bohemian Ibiza. Stops at San Juan & San Vicente. 5-Drive to the country side to visit the authentic wine yards of Santa Inés and San Mateo. This is the perfect excursion for those who want an unforgettable day of Jeep adventures and lots of fun at sea. Get the ride of your life in Ibiza exploring little-known calas, cultural stops and local treasures while admiring the spectacular coast views. 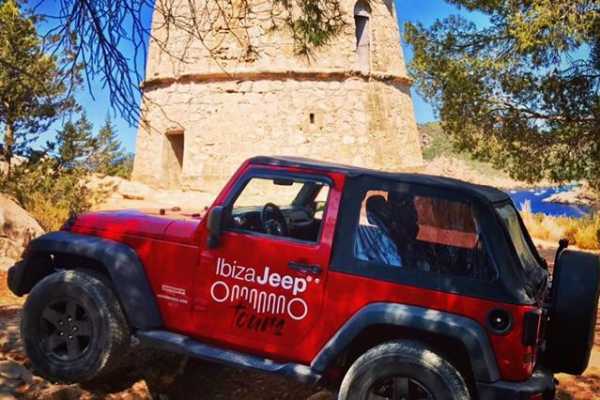 A Tour around Ibiza with brand new Jeep Wranglers is the best way to discover this unique island. We could tailor made any experience based on your preferences and desires. Pick up at accommodation around 11:30pm / Duration 8/9 hours Drive to the highest view point of the island to appreciate a 360 view (475 m. high). Paddle surf excursion (stand up paddle) to caves with instructor. Snorkeling in a secret beach. Visit to a historic defense tower driving trough forest and off road track beside a cliff with amazing views to the line coast. Cliff diving in a unique spot. Visit to a majestic monument in a cliff with views to the mystic Es Vedra rock island Visit to huge cave where the sea is coming in from both sides. Drive back to your accommodation around 8:30pm Digital photo album of whole experience. PREMIUM TOUR: PAELLA, CLIFF DIVING, SNORKELING.